Welcome to Barkman & Smith Physical Therapy' guide to Bunions. The term hallux valgus actually describes what happens to the big toe. Hallux is the medical term for big toe, and valgus is an anatomic term that means the deformity goes in a direction away from the midline of the body. So in hallux valgus the big toe begins to point towards the outside of the foot. As this condition worsens, other changes occur in the foot that increases the problem. One of the other changes that occurs is that the bone just above the big toe, the first metatarsal, usually develops too much of an angle in the other direction. This condition is called metatarsus primus varus. Metatarsus primus means first metatarsal, and varus is the medical term that means the deformity goes in a direction towards the midline of the body. This creates a situation where the first metatarsal and the big toe now form an angle with the point sticking out at the inside edge of the ball of the foot. The bunion that develops is actually a response to the pressure from the shoe on the point of this angle. At first the bump is made up of irritated, swollen tissue that is constantly caught between the shoe and the bone beneath the skin. As time goes on, the constant pressure may cause the bone to thicken as well, creating an even larger lump to rub against the shoe. The symptoms of hallux valgus usually center on the bunion. The bunion is painful. The severe hallux valgus deformity is also distressing to many and becomes a cosmetic problem. Finding appropriate footwear can become difficult, especially for women who want to be fashionable but have difficulty tolerating fashionable footwear. Finally, increasing deformity begins to displace the second toe upward and may create a situation where the second toe is also constantly rubbing on the shoe. How do health care professionals identify the condition? Diagnosis begins with a careful history and physical examination by your doctor. This will usually include a discussion about footwear and the importance of shoes in the development and treatment of the condition. X-rays will probably be suggested which allow your doctor to measure several important angles made by the bones of the feet to help determine the appropriate treatment. Our Physical Therapists at Barkman & Smith Physical Therapy can assist you in many ways with a painful bunion and hallux valgus. 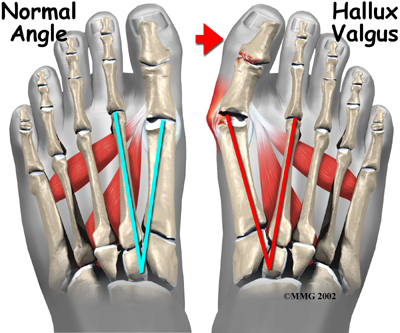 Treatment of hallux valgus nearly always starts with adapting footwear to fit the foot. Your Physical Therapist will ask you many questions about the type of shoes you wear and may even ask you to bring your shoes in so we can observe them. In the early stages of hallux valgus, converting from a shoe with a pointed toe to a shoe with a wide forefoot (or toe box) may arrest the progression of the deformity. Since the pain that arises from the bunion is due to pressure from the shoe, treatment focuses on removing the pressure that the shoe exerts on the deformity and wider shoes immediately reduce the pressure on the bunion and the added space in this part of the shoe keeps the metatarsals from getting squeezed. Bunion pads may also reduce pressure and rubbing from the shoe. Your Physical Therapist will advise you on the best shoes for your condition. There are also numerous devices, such as toe spacers, that attempt to splint the big toe and reverse the deforming forces. Many of these spacers are designed to be worn during the night but a few can be worn during the day in a shoe with a larger shoe box. Special bunion pads are also available that are placed over the bunion to relieve some of the direct pressure.Your Physical Therapist will discuss whether these devices would be useful for you and inform you on where you can purchase them. Taping can be trialled as a cheaper alternative and can help you decide if a rigid support may help. In addition, your Physical Therapist may suggest the use of foot orthotics depending on the alignment of your arch. The orthotics support the arch and hold the big toe in better alignment. When the bunion is acutely painful the above changes to your footwear and use of splints may allow you to resume normal walking immediately, but it is still wise to cut back on more vigorous activities for several weeks to allow the inflammation and pain to subside. Your Physical Therapist can advise you, however, on alternative activities that allow you to maintain your cardiovascular fitness while you allow the pain in your toe to settle. A stationary bicycle, rowing machine, or water activities like running or aerobics are good alternatives to activities such as regular running or walking. Physical Therapy treatment at Barkman & Smith Physical Therapy can also assist with decreasing the pain and swelling caused by the bunion. Your Physical Therapist may use electrical modalities such as ultrasound or interferential current to reduce your pain. Moist heat or ice may also be recommended as a pain-reliever. A more hands-on treatment such as soft-tissue massage around the area or mobilizations of the joints of the toe and foot may also be used by your Physical Therapist. These mobilizations help to gently stretch the tissues and encourage the joints to move into their normal range of motion. Therapy sessions sometimes include iontophoresis, which uses a mild electrical current to push anti-inflammatory medicine to the sore area. In addition to assisting with the pain and swelling, your Physical Therapist may prescribe some simple stretching and strengthening exercises for the foot and toe to combat the progression of the deformity. Exercises to strengthen the muscles that lift your arch may also be prescribed. Lastly, your Physical Therapist will assess the alignment and entire biomechanics of your lower limbs while you stand still and while you walk. If you are a runner, they may also ask you to bring your runners and assess your running biomechanics. 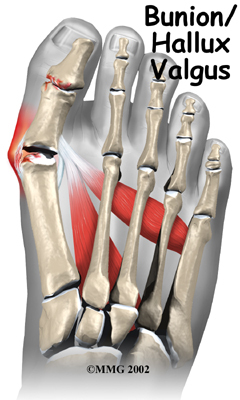 Abnormal alignment or biomechanics can lead to poor use of the foot and added pressure onto an already painful bunion. Once we have assessed your entire lower limb, we may prescribe strengthening or stretching exercises for areas that to you seem unrelated to your foot, such as your hip, knee or core area. These areas, however, are particularly important in maintaining the alignment and posture through your leg and into your foot and toe. Although the Physical Therapy treatment we offer at Barkman & Smith Physical Therapy often provides significant relief from a painful bunion, if you continue to experience significant pain or the problem seems to be getting worse, a surgical consult may be required. In some very mild cases of bunion formation, surgery may only be required to remove the bump that makes up the bunion. Surgical alignment of the bones is not completed. This operation, called a bunionectomy, is performed through a small incision on the side of the foot immediately over the area of the bunion. Once the skin is opened the bump is removed using a special surgical saw or chisel. The bone is smoothed of all rough edges and the skin incision is closed with small stitches. In most cases it is more likely that a realignment of the big toe and a balancing of the muscles around the joint will also be necessary. 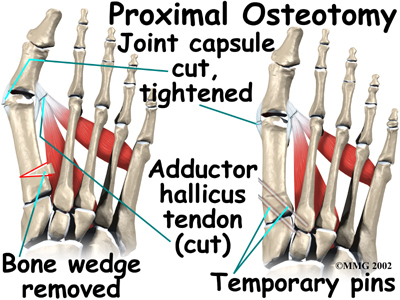 The major decision that must be made is whether or not the metatarsal bone will need to be cut and realigned as well. 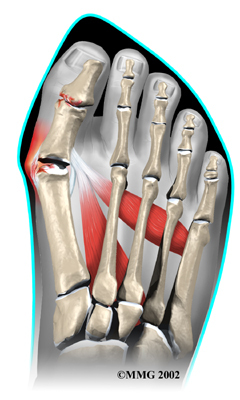 The angle made between the first metatarsal and the second metatarsal is used to make this decision. The normal angle is around nine or ten degrees. 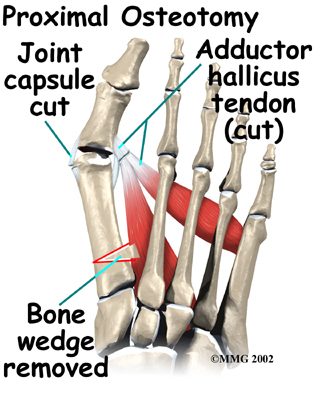 If the angle is 13 degrees or more, the metatarsal will probably need to be cut and realigned. In some cases, the far end of the bone is cut and moved laterally (called a distal osteotomy). This effectively reduces the angle between the first and second metatarsal bones. This type of procedure usually requires one or two small incisions in the foot. Once the surgeon is satisfied with the position of the bones, the osteotomy is held in the desired position with one, or several, metal pins. Once the bone heals, the pins are removed. Removing of the pins usually occurs between three and six weeks following surgery. 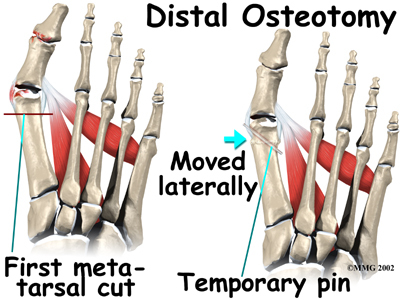 In other situations, the first metatarsal is cut at the near end of the bone (called a proximal osteotomy.) This type of procedure usually requires two or three small incisions in the foot. Once the skin is opened the surgeon performs the osteotomy. The bone is then realigned and held in place with metal pins until it heals at which point the pins are removed. 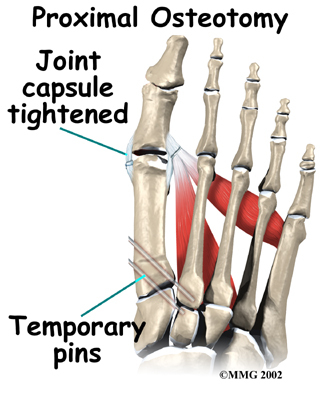 Again, this reduces the angle between the first and second metatarsal bones. It will take about eight weeks before the bones and soft tissues are well healed. You may be placed in a wooden-soled shoe or a cast during this period to protect the bones while they heal. You will likely need crutches briefly after surgery, so a Physical Therapist in the hospital will be consulted to show you how to use them and ensure that you can safely go up and down stairs with them. Some surgeons do not recommend crutches, but rather advise you to ‘heel walk’ in order to decrease the pressure on the surgical toe. This can be done without the use of crutches so long as pressure on the toe is avoided. You will probably wear a bandage or dressing for about a week following the procedure. The stitches are generally removed in 10 to 14 days. Obviously if your surgeon chose to use dissolvable sutures you won't need to have the stitches taken out. Physical Therapy at Barkman & Smith Physical Therapy usually begins after the stitches have been removed. If you have ongoing pain, we can use modalities such as interferential, ultrasound or moist heat to reduce the pain. Gentle massage and light mobilizations or traction to the joints of the toe and foot can also assist with pain and any ongoing swelling in addition to improving mobility of the foot. Both the range of motion and strength in your foot and likely your entire low limb will be decreased due to the surgical procedure as well as your altered gait pattern. Your Physical Therapist will prescribe some stretching exercises for your toe, foot and calf, as well as some strengthening exercises for the same areas. Strengthening exercises may be as simple as picking up marbles with your toes or may include the use of Theraband or small elastics. Since the alignment of the foot is maintained by not only the muscles of the foot, but also those of the hip, knee, and core area, we will also prescribe strengthening exercises for these areas. Maintaining proper alignment is particularly important to avoid further problems with the foot and surgical toe. As you get stronger we will prescribe more difficult exercises such standing on your foot on an uneven surface, repetitively raising up onto your toes, and then raising up onto your toes and maintaining this position to improve muscle endurance. These exercises will also improve your proprioception, or ability to know where you foot is without looking at it. Once your foot is mobile and strong enough, we will encourage you to do a short period of uphill walking which helps to both improve the range of motion in your toe and also increase the strength of the foot. At Barkman & Smith Physical Therapy we believe that it is important for you to maintain your cardiovascular fitness while you are recovering from the surgery for your bunion. Although heavy endurance walking or running will not be recommended until a bit further on in your recovery, in the early stages you can still use a stationary cycle, a rowing machine, or can get in the pool once the scar is healed to partake in water running or aerobics. The final part of our treatment at Barkman & Smith Physical Therapy will be to ensure that you are walking with a proper gait. Being that each person take thousands of steps per day, if you are walking inefficiently or with poor alignment, it can quickly and easily lead to further pain and problems in your foot or up into your ankle, knee, or hip. A period on crutches or in a walking boot often leads to an adapted walking pattern that sometimes carries on once you are off the crutches or out of the walking boot. Your Physical Therapist will address any abnormal walking pattern and teach you how to correct it. The strengthening exercises that we prescribe as mentioned above will be important to gain enough strength and control to walk normally after your surgery. During your follow-up visits with your surgeon, X-rays are usually taken so that the surgeon can follow the healing of the bones and determine how much correction has been achieved. Generally recovery from surgery for a bunion goes extremely well. If however, you are not improving as your Physical Therapist at Barkman & Smith Physical Therapy would expect, we will ask you to follow up with your surgeon to confirm that there are no complications from the surgery or problems with the hardware in your foot that is impeding your recovery.